This entry was posted on April 10, 2013 by Sports Traveler. Whoa! The sports world is going crazy right now! So much going on and it is all too exciting to miss. To catch up with the sports world I have harnessed all the major news/results from the recent events. 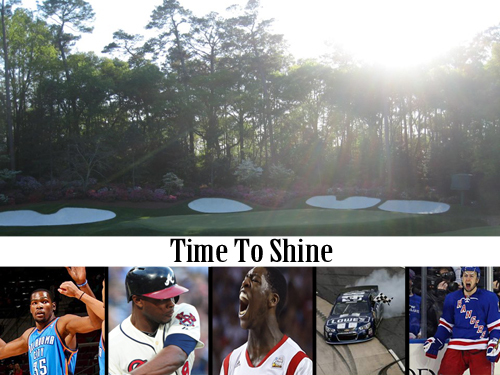 I am going to briefly hit on each sport and give a few predictions for the Masters, MLB, NBA, and NHL. Ready? Lets go! Seems like the season just started but it will shortly be coming to an end. But I guess that's what happens when you are in a shortened and compressed 46 game season. Thanks lockout. The story early on in the season was the winning streak by the Chicago Blackhawks and then both the Anaheim Ducks and Pittsburgh Penguins went on their own winning streaks. Although no one has matched a start like the Blackhawks, it seemed for a while like the Penguins might be the best team. Now that Crosby is out the battle for best appears to be between the Ducks and Blackhawks. Note: The Blackhawks and Penguins are the only teams to have clinched a playoff spot. Bold Prediction: The West will win the Stanley Cup. Blackhawks or Ducks?? Not sure. All comes down to goalie play. The Par 3 tournament kicks off today and it always signifies the beginning of the Masters. Sure the first round isn't played until Thursday but its the first evidence of competition on the course and that is always exciting. It is also a really fun and laid back round for the players. Probably the best round to watch live because of the loose nature of the players. However, we all know the real fun begins tomorrow and the question remains as to where Tiger will finish? Bold Prediction: I can't help but take Tiger. His return to the #1 spot will be cemented with a 5th Green Jacket. My final thought on the Final Four is that of satisfaction. Although I was unable to repeat in my bracket pool, I am quite excited about how the college basketball season came to an end. The Championship Game was incredible and did not disappoint. Congrats to Rick Pitino on his Championship, induction into the Hall of Fame, and the hiring of his son to coach at Minnesota. Louisville vs. Michigan lived up to the billing, and now I can't wait for 2014 when the "Big Dance" lands at Cowboys Stadium for the Final Four. Sad that the regular season will be over in a week but the good news is the NBA Playoffs start! Despite a 13 game winning streak by the Knicks, the NBA season is approaching a lack luster finish. The race for the final spot in the West would be interesting if we haven't heard about it since the Lakers started off poorly. Only thing I'm watching for is who wins the scoring title. Melo or Durant?? Lets just get to the playoffs already. America's pastime has returned to the spotlight as the MLB season opened last week with much fanfare. We almost saw a perfect game on Opening Day but Yu Darvish failed to record the final out for the Texas Rangers. Justin Upton is on fire with 6 HR in his first 7 games in a Braves uniform. We have also seen aces, not named Clayton Kershaw, across the league struggle in their first few starts. We are only a week in but I'm already pumped for a summer full of great baseball!